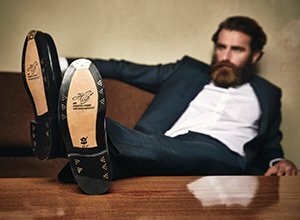 A pair of Goodyear-welted men’s shoes is a promise of elegance, comfort and durability. Not only are our products made of high-quality materials, but our service aims to fulfil the same quality standards, too. We offer a great shopping experience, fast and safe delivery and are pleased to be at your disposal at any time. We work for your recommendation. Interested in comprehensive shoe care? Come to our shoe care seminar in Berlin. Read more about it here. Not satisfied with your pair of Goodyear-welted shoes? No problem. You can return your goods within 30 days, no questions asked, for a full refund. Please try out your new shoes on a soft footing like a carpet first and if possible, do not remove the labels. This is of course however not a condition for the successful return of your shoes, if you are unsatisfied with them. We want you receive your pair of Goodyear welted shoes as soon as possible. If you place your order before 3 pm on a work day, we will process it on the same day. Generally, delivery takes 3 to 4 working days, if the delivery address is in the United Kingdom. Experience our first-rate delivery service for yourself. We track your delivery status and update it daily so that you can follow your shipment in real time. Shopping at SHOEPASSION.com should be a stress-free experience. Therefore, we use secure SSL encryption for all orders. SSL encrypts the personal data you provide us to ensure it is safe and not accessible by any third parties. We comply strictly to laws concerning data protection and promise that your data is exclusively used to process orders and to continually improve our measures of quality management. Protecting your privacy and personal information is very important to us. That is why we take the trouble to specify the details of such a delicate issue. Whilst browsing our homepage, you remain completely anonymous. When you make a purchase or use our contact form, we will encode your personal data. We will under no circumstances allow your personal information to be viewed by any third party. All personal information will be handled strictly in accordance with German and European data protection laws. By the way: we host our site on German servers, whose security requirements are so high that they’re even trusted by the major German banks.